Darts Away has chalked up his seventh career win by taking out the 2018 Adaminaby Cup. The win made it back to back Cups for JJR with last year's washout. Chasing Charlie blitzed them the year prior in 2016. Ridden by Patrick Scorse due to Aaron Sweeney falling ill, everything worked out nicely on the day in front of a packed out crowd braving the freezing conditions. Settling in the one out one back position, Darts chimed into the race at the right time as they swung for home. With obvious danger Bondo not shirking the task it was up to the courage of Dart to prevail and that he did. 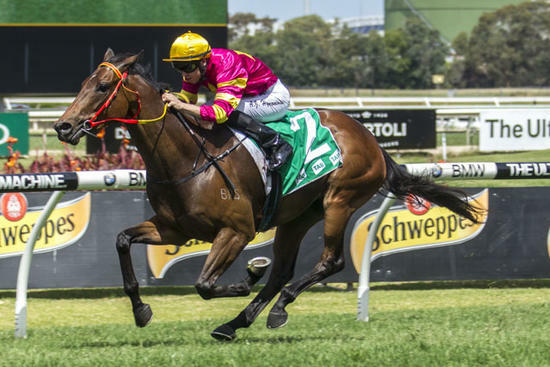 It was the first win in some time for Darts and it also gave Patrick Scorse extra satisfaction given he was the first horse he ever rode for victory for JJR some 18 months ago (Darts Away's last win also). Country Cups mean plenty to the team and it joins the cabinet of Canberra, Dubbo and Bombala Cups in 2018 alone.